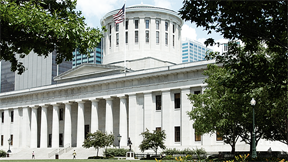 Ohio Board of Regents Chancellor Eric Fingerhut honors the first class of more than 400 scholars of the Choose Ohio First Scholarship Program from 35 of Ohio's public and private colleges and universities around the state. The scholars represent some of Ohio's most promising students studying in several of the most innovative Science, Technology, Engineering, Mathematics, and Medicine (STEM) and STEM education programs in the country. With additional remarks by State Sen. Jon Husted (R-Kettering) and Anthony J. Dennis, President & CEO of BioOhio.